Set in 1896, The Fields Beneath involves its young participants in the tensions between Londoners’ sometimes conflicting needs for open spaces and for new housing, all in the months leading up to Queen Victoria’s Diamond Jubilee. 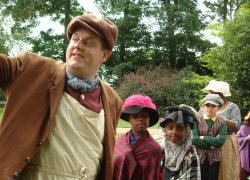 Children take on the roles of a Victorian school group on a nature walk, and are asked to make their own judgement about some topical questions. 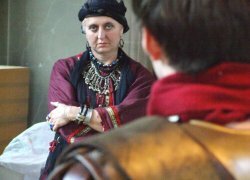 Set in London’s earliest years, Ultima Britannia is set in the building site that will one day become the Roman villa whose floor survives three metres under the modern floor level of All Hallows by the Tower. 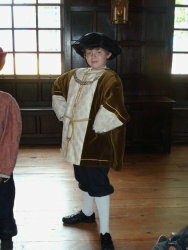 It’s 1533, Henry VIII is king, and about to marry for a second time. In the City of London beside the River Thames a company of boatmen is unpicking one woman’s initials from a beautifully decorated barge and replacing them with another’s. The same is happening at Hampton Court. Around the City of London, the Lord Mayor’s officials are knocking on doors, cajoling, threatening and imploring for co-operation and cash. In desperation, they may resort to blackmail. This project aims to build up an imagined yet historically based picture of life in Hackney in the past from a child’s perspective. Groups of primary-age children focused this year on the 1530s when Henry VIII was king, Hackney was a village and the country was in the midst of a period of radical change.